IronSocket.com is a Virtual Private Network service, owned by Sense-IT LLC, which began its life as the highly-rated HideMyNet.com back in 2005. HideMyNet recently underwent an upgrade and rebranding process, resulting in the launch of IronSocket, which is based out of Hong Kong. The company which owns IronSocket has been in business since 1998 and places a strong emphasis on that fact for good reason; it demonstrates extremely reassuring shelf-life in a market which has only boomed in recent years. IronSocket is marketed as a multi-purpose VPN provider and also offers DNS proxy services. Like other VPN providers, IronSocket requires completion of a registration process and the installation of basic software. The service makes use of either OpenVPN, PPTP or L2TP protocols in order to encrypt both incoming and outgoing internet traffic, protecting it from numerous potential threats, including hacking and snooping. Additionally, when a customer connects to one of the provider’s servers, their IP address is effectively replaced, rendering them anonymous. This also allows users to bypass internet filters and unlock content which is restricted or affected by region, such as Netflix and the BBC iPlayer. IronSocket has a presence in an impressive number of countries all over the world, with servers based in North America, South America, Africa, Europe, Asia and Australia. IronSocket have opted for a simple pricing strategy, whereby they offer one main product, allowing users to sign up for different periods of time. As with many similar services, long-term subscription is rewarded with a discount on the basic price and the company’s prices are very competitive, leaning towards the cheap end of the market. At present, a one month subscription is available for $6.99, which is a fairly standard price. 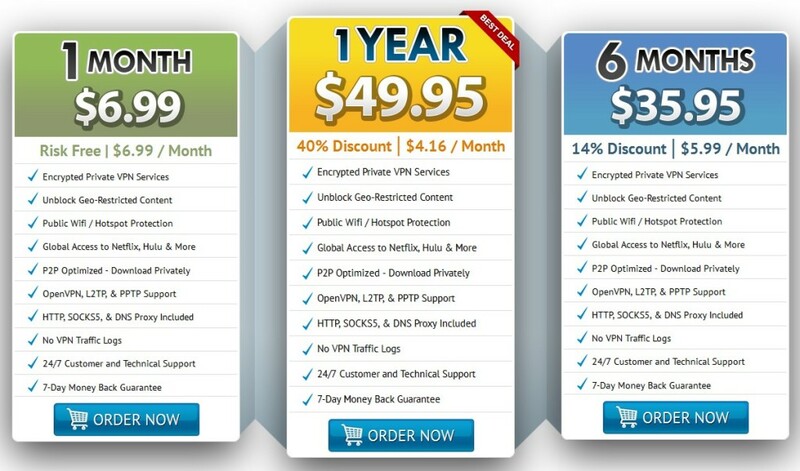 Users can instead opt to buy the six month package for $35.95, which works out as $5.99 per month, or the one year package for $49.95, which works out as $4.16 per month. Access to HTTP proxy, SOCKS5 proxy and DNS servers are included in all packages. Unlike with some competitors, there is technically no free trial option available. However, a seven-day money back guarantee can essentially be used as a free trial, as customers are able to claim a refund if they are unhappy with the service. In terms of encryption, IronSocket makes use of the ideal OpenVPN protocol where possible, although support for the main other protocols is available, which is useful for devices which are not compatible with OpenVPN. The service implements 256-bit AES encryption, which ensures customers are very secure while they are online. P2P support is offered, albeit only on servers located in certain countries. This is based on the legislation in those countries and all servers allowing P2P use are clearly marked within the client software. The SOCKS5 proxy included within the package is especially useful for P2P downloading. The main website is detailed and easy to navigate, with extensive setup and FAQ sections covering the majority of issues customers are likely to face. In addition, for users with other concerns, a ticket-based contact form is available 24 hours a day, with rapid response times. Yet, compared to other VPN providers around, the amount of contact methods available is extremely limited and may disappoint people who would prefer a method of direct contact, rather than having to wait for a response. + The network contains a large range of servers, located in countries all over the world. + P2P and BitTorrent use is permitted, although this activity is restricted to certain designated servers. + Can be used on up to three devices simultaneously, with the option to purchase even more connections. + Competitively priced, with a money back guarantee and the option to pay using the anonymous BitCoin currency. IronSocket has continued where HideMyNet left off, by offering an impressive VPN product, with servers located all over the world. The encryption methods used are top notch and the product is competitively priced, while the inclusion of DNS and other proxy services is a welcome bonus. Moreover, the support of P2P downloading represents a plus point over many other VPN providers on the market today. However, although internet activity of customers is not monitored, the most security and privacy conscious users may be put off by the amount of data that is collected, while experienced VPN users may not be satisfied by the lack of advanced features. That said, IronSocket caters extremely well for the vast majority of possible VPN needs.